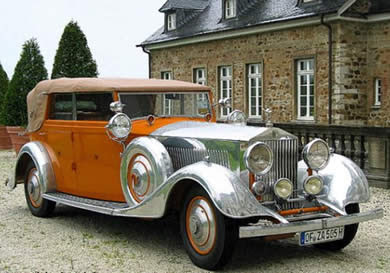 World renouned Rolls Royce collector Hans-Günther Zach is selling his spectacular Rolls-Royce museum. Bids of 5m euros or more are invited for the complete collection, comprising 24 Rolls-Royces, 3 Bentleys and 50 pieces of antique furniture. Within the collection is a Phantom II, better known as the ‘Star of India’. 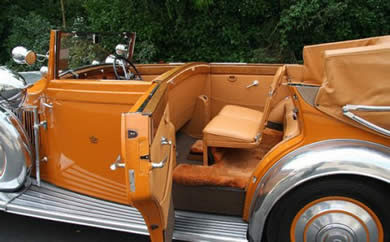 The unique coach-built Rolls-Royce Phantom II 40/50 HP was delivered in 1934 as Continental All-Weather Convertible. The original owner being none other than His Highness the Maharaja of Rajkot. The striking orange and polished aluminium bodied car has many unique features such as headlights connected to the steering to follow the road around bends, decades before Citroen followed in its path. The Star of India Phantom II is one of the most unique and valuable of all historic cars and has a vast history with several royal connections. It has been suggested that this car alone could be sold for as much as 10 million Euros. The full collection of 27 mostly pre-war Rolls Royce cars also includes a beautiful pollished aluminium 1926 Rolls-Royce 40/50 HP Phantom I Open Tourer, first owned by the Maharaja of Nanpara, known as the ‘Aluminium Sculpture’. It is unknown why Heir Zach is selling his collection but should a deal go ahead it will be the most signifcant Rolls-Royce sale ever. If the Star of India is sold alone it could even fetch a record sum for a classic car – the current record being $9.8 million for a 1931 Bugatti Royale back in 1987. So what kind of alarm do you put on a £10 million car?